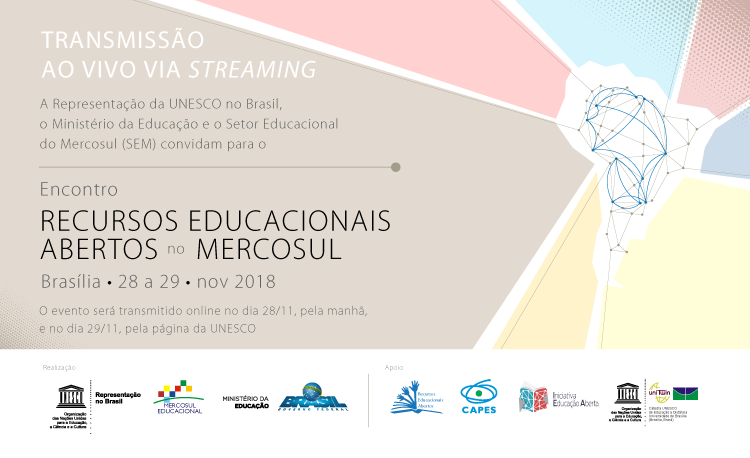 In order to discuss and advance a common agenda for OER in the region, representatives from Ministries of Education and experts will meet in Brasília between the 28th and 30th of November, 2018. State representatives from Brasil and members of organisations will be invited to better understand the theme and co-create policy proposals and actions. Due to space limitations the event will be restricted to those invited, but there will be live streaming (including sign language). In this meeting, we will reference the Draft UNESCO Recommendation for OER (available in EN/FR),a UNESCO normative documento currently under review. See also a brief description of the process that took place to construct this Recommendation. Through this discussion we are building a set of Recommendations for OER in MERCOSUL. Share your comments! When: November 28-30, 2018 (live streaming 28th-29th). Organisers: UNESCO-Brasil, Ministry of Education (Brazil) and Mercosul Educational Sector. 14h – 18h – Workshop “How to implement an Open Education policy” (no live streaming, local workshop only for representatives from Brazilian States), based on the book Como Implementar uma Política de Educação Aberta. Organised by the Open Education Initiative. Discuss a set of recommendations and next steps around OER, in order to identify possibilities for collaboration. The term Open Educational Resources (OER) was adopted within a Global Forum held at UNESCO headquarters in Paris in 2002. Fifteen years later, the OERs have definitely been integrated into the agenda of governments and institutions who are interested in promoting values such as equitable and inclusive quality education, which the United Nations Sustainable Development Goal 4 (SDG 4) aims to ensure. In 2012, the UNESCO World Open Educational Resources (OER) Congress resulted in the Paris OER Declaration, which called on governments to implement open education policies to promote and foster OER. In 2017, the UNESCO World Open Educational Resources (OER) Congress resulted in the Ljubljana Action Plan 2017 and a Ministerial Commitment (signed by 11 countries) based on the guidelines of the Paris Declaration (2012). The process of developing an OER Recommendation for possible adoption by the UNESCO General Conference in 2019 initiated in 2016. The possibility of its ratification would mean that Member States should periodically report to UNESCO on the progress made in the area of OER. This will both consolidate the work carried out by several Member States and promote OER to other countries, which are still learning about the subject. In Brazil, this area has had significant progress. The goals 5 and 7 of the National Education Plan (2014-2024) emphasize the importance of open educational resources to foster the quality of basic education. Resolution CNE/CES No. 1, from 11 March 2016, declares the ‘creation, availability, use, and management of open educational technologies and resources released under a free licence to facilitate the use, revision, translation, adaptation, recombination, distribution, and free sharing by citizens, protecting the pertinent copyright.’ More recently, the Ministry of Education (MEC) published an Ordinance in the Official Gazette, which defines the criteria for acquiring OER for basic education produced by public funds from the Ministry. The document stated in its Article 7 that educational resources acquired or produced by public funds should always be under an open licence. Building an agenda of cooperation around OER. The first day will be an opportunity for raising awareness and training Brazilian public managers on the importance of OER.